The layout consists of two segments. For the moment it has a length of 214 cm and a height of 72 cm. On level 0 cm there is a storage station for 3 trains and 3 railcars. Near W a 5 levelled track helix leads to the terminus station on level + 21 cm. Near A and B the layout is to be extended in a circle throughout the room on level 0 cm. Near S is situated the layout control panel on level 0 cm. The layout is to be extended to 9 segments and one removable element. In the valley of the brook a quarry, a road and a level crossing are to be constructed. The quarry will receive its own narrow gauge railway. It is coloured in blue on the plan. On the road a leisury traffic is to be imitated. 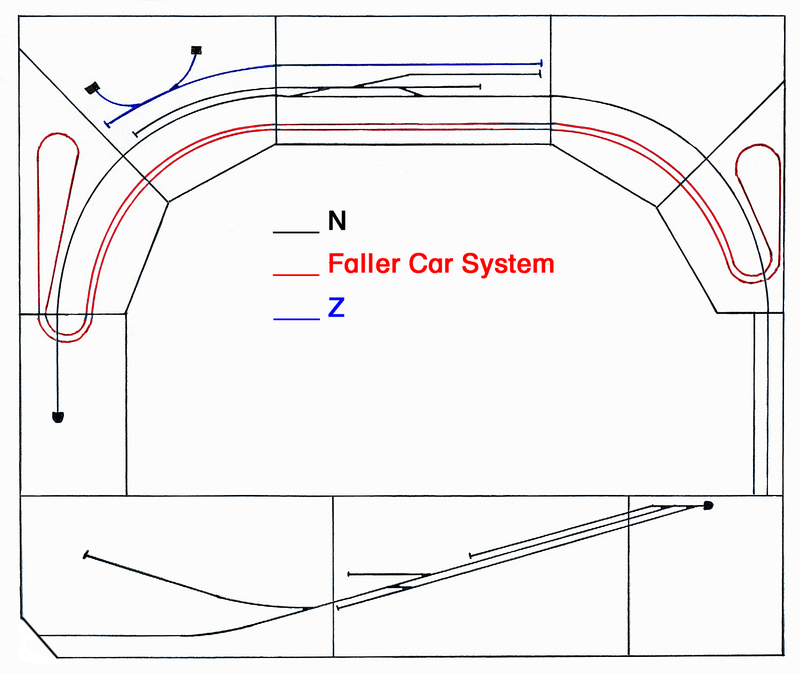 The Faller Car System is coloured in red. A knight's castle will be built on top of a hill along the valley. 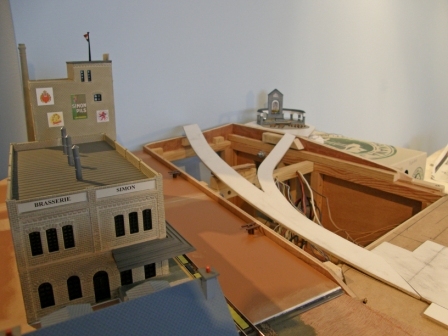 The small segment with the castle is under construction. The foundation is based on strips of 1,8 cm x 1,8 cm. Four strips lie upon each other in order to establish later the valley of the brook. All former segments were built in this manner years ago. I had problems to find the same strips as in the past. In many do-it-yourself stores they only offer strips of 2 cm x 2 cm. 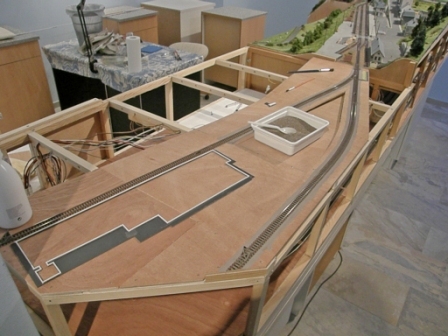 The tracks lie on plywood of 5 mm. Here also I mostly found sheets of 4 mm or 6 mm. All was glued with PVA glue. The segments are joined by 3 abridged thread screws of 8 mm. The current connection is made by Brawa plugs 3093. On the top of the hill the Kibri castle 37304 will be estabished with an altered slate roof. Between the segments a short Fleischmann track 9103 was simply clipped. The rest is flextrack, which was laid with Krause clamps and fixed with Post screws. The segments can therefore be easily separated. To cut the flextrack I fix it together with the clamps the other way round in a small vice. I then cut from the side of the ballast with the small Roco saw. At the ends, the track is filed smooth. The current is supplied by Arnold rail joiners 7100. The wires are connected by luster terminals to the cables, that run trough each segment. 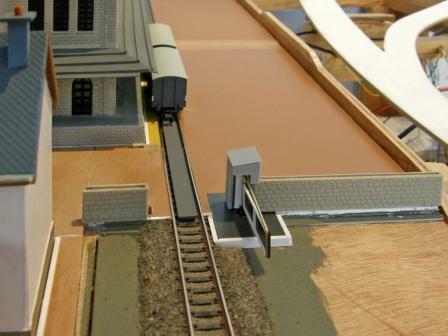 The tunnel portal was cut out of plywood with a compass saw in the dimensions of the Peco model. In the tunnel I establish a removable tube of 24 cm. The tube consists of a plywood frame with thinn plastic walls. So that the trains can't fall out of the segment, plastic sheets have been srewed as crash barriers. I nailed Noch wire grid 60990 on the plywood of the segment. The Kibri castle hill was fixed with screws. Upon the wire grid I laid gypsum stripes from the chemist's. The Heki rock sheet 3502 was cut into pieces and fixed with window putty onto the gypsum stripes. The window putty was modelled with the fingers and adapted to the rocks. The tunnel entry was glued. Now the mountain has to dry for a longer period. The walls of the Kibri castle are painted with matt Humbrol enamel colours. Afterwards a mixture of light grey Pelikan Plaka colour is applied. The wet paint is wiped up with a smooth rag. The parts of the caste don't fit exacly together in same places. The chinks are filled with Humbrol Model Filler. Some windows consist only of transparent plastic sheets. The window frames are drawn with a brown Stabilo OHPen Permanent Fine. The arms of a local castle are taken from Internet. They are reduced on 5 X 6 mm, printed on white adhesive tape and fixed on the castle tower. On the gypsum surface of the mountain is applied a mixture of wood glue and brown powder colours.The rocks are painted with Pelikan Plaka colour. On slightly diluted PVA glue are pressed Heki flocks and Decovlies on small surfaces. The green surfaces have to seem irregular and wild. The pines come from the Faller Premium range. The bushes are cut up Feuillage from Sylvie Debono. The Preiser figurines on the castle are fixed with instant glue. A flag is made with an Evergreen round profile and a painted rag. The segment with the brewery will have the size of 145 X 72 cm. It consists on level 0 of a maintrack and 3 sidetracks. The Fleischmann electrofrog points will have underground motors. 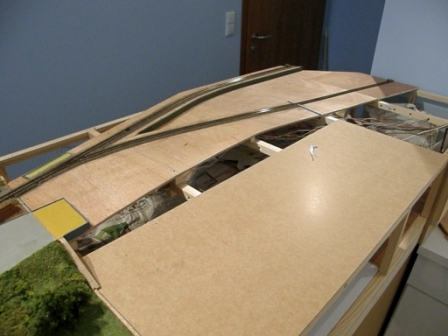 They will be switched as thinking points from the operating desk thus allowing the storage of 3 trains. The radii of the curves will be 30 and 33 cm. On level 1, behind the terminus station, a further right point will be laid. The main track runs on in direction Bastogne. The other track is the connection to the brewery. It descends a little and is recessed in the yard. A Herkat uncoupler allows the storage of seweral beer waggons. The curves have a radius of 1 meter. The segment has finally only the size of 130 X 72 cm. On level 0 are one main track and 4 side tracks. The radii are 39,5 cm (R 3 Fleischmann) and 43 cm (R 4 Fleischmann). 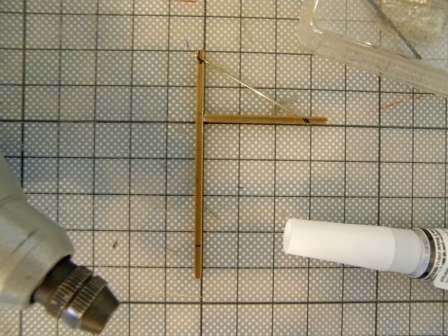 5 strips of 1,8 X 1,8 cm lie under a plywood sheet of 5 mm. The tracks are placed provisionally and drawn. With the compass saw I cut rectangles of 2,5 X 8 cm for the Fleischmann motors. 6 cables of 1,5 mm are laid into the segment with the help of Brawa plugs 3093. 2 are for driving current (14 volt DC), 2 for switching current (16 volt AC) and 2 cables are to interrupt the driving current ( when the future folding bridge is open). A white MDF sheet is installed as acontrol panel. 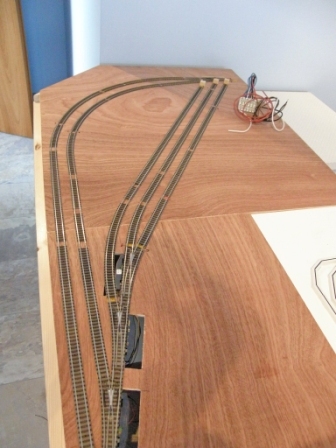 After the 6 lines of 1,5 mm are clamped, the tracks are laid and fixed with Post screws. Sections without current are equipped with plastic rail joiners (Arnold 1170 Fleischmann 22214) and rail joiners with soldered cables (Arnold HN8032 Fleischmann 22217). 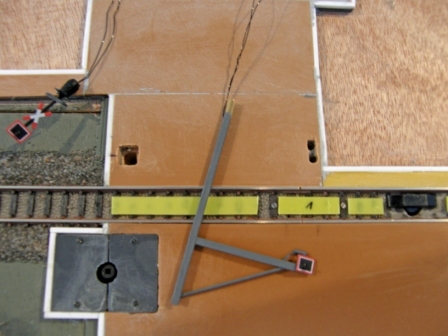 The Fleischmann track control panel elements are fixed on the MDF sheet. The whole segment is extended and laid the other way round on a table. The turnouts are connected to the switches.Then the whole thing is installed again and tested. As the Fleischmann turnouts 9178/9179 are intelligent, the trains stop, if the turnout lies wrong. The side parts of the segment are installed and fixed with white glue and clamps. The horinzontal strips are cut to measure one by one. Holes are drilled inside to put the cables. 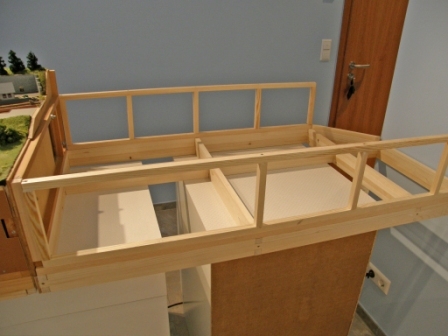 After this the strips are installed with screws and white glue. The plywood panel for the upper level is cut and applied. The tournout is provisionally laid and sketched in. 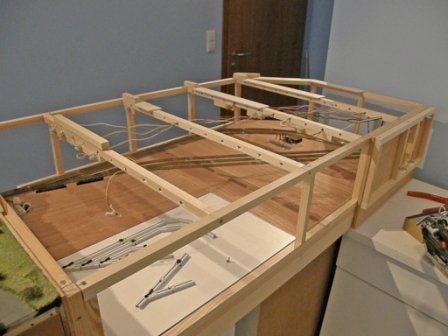 The one meter track radii are drawn with a self-made MDF pattern .The plywood panel is removed and a rectangle of 2,5 X 8 cm is sawn out for the Fleischmann motor. The cables are laid into the bars and the terminal strips are screwed. The plywood sheet for the upper part is glued and screwed. The tracks are laid and fixed with Post mini screws. At the transition of the segment lies a short track on a thin Busch Plastic sheet 7203. This has to be gravelled and decorated in a way that it doesn't stick and can be removed, when the segments are separated. 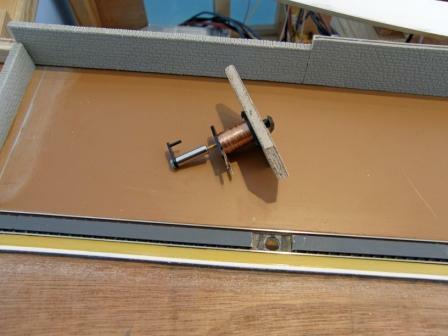 Around the rectangular hole for the turnout motor I glue a frame again with Busch plastic sheets 7203. On top of it is fixed a lid with small screws. Thus, even after years, one has easy access to the motor in order to eventually replace it without damaging the landscape. I paint the rails with matt Humbrol 70 paint. I clean the upper part immediately with a rubber. I screw two 5 mm plywood sheets under the place where I intend to install the uncouplers. I drill two holes for the Herkat 2703 uncouplers. After I solder 2 cables onto the solenoids. I screw the uncouplers from underneath and regulate their heights after numerous tests. The Fleischmann tracks are first fixed with Post mini screws. I sprinkle Heki 3329 gravel on both sides. I disperse the gravel with a paintbrush and trickle Heki 1830 glue on top. Thus the track is maintained. The screws can be removed after a day and reused. 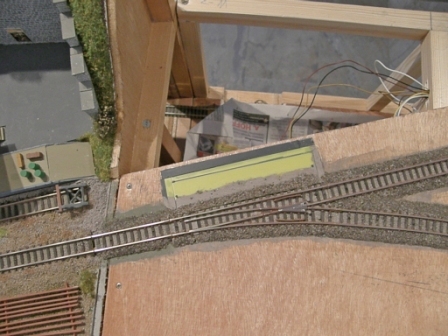 The loading ramp in the freight yard is extended with a 10 mm plywood sheet. Around and on top of the plywood I glue Kibri 7969 wall sheets and Busch 7203 plastic plates with white glue. A 3 mm MDF sheet for the football ground is sawn and glued on the sheets. The Kibri wall plates 7969 are cut with a craft knife and fixed with PVA glue to the railway train path behind the brewery. I paint them slate grey with mat Humbrol enamel colour 67. After a day I apply grey Pelikan Plaka colour 72 and wipe upon immediately with a mild moist rag. Thus the grey colour remains in the chinks. I built the engine shed consulting photographs. I put 2 rails with Fleischmann track spacing on a grey Busch 7203 sheet. For the lenght I took a steam engine with a tender. To fix the height, I put a slightly oversized series 1800 diesel engine on the rails. After these premises I drew the walls and the windows on scale paper. The plan was drawn in a way that the whole building can be transferred on to one yellow Busch 7203 sheet. With paper clips I fixed the plan together with a sheet of carbone paper on to the plastic sheet. 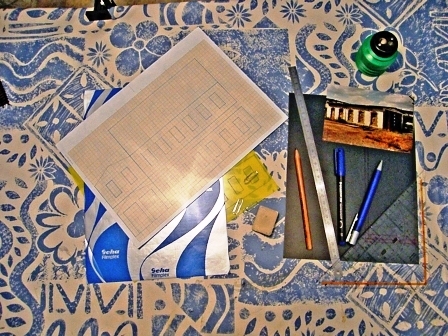 With a pencil and a drawer I traced the whole plan and by this way transferred it to the plastic sheet. With a cutter and a metal drawer I cut the windows and the doors. I first carved for each window a rectangle and after this 2 lines in the form of an X. Now you can dent the plastic and 4 small triangles fall out. After cutting the 4 walls, I glue stripes of Kibri 7961 wall sheets for the socket. After this the windows are handicrafted. Out of the transparent plastic box from a waggon I cut 4 "glass panels" with my Proxon blade. Each side wall of the shed receives its own "glass panel" with a number. 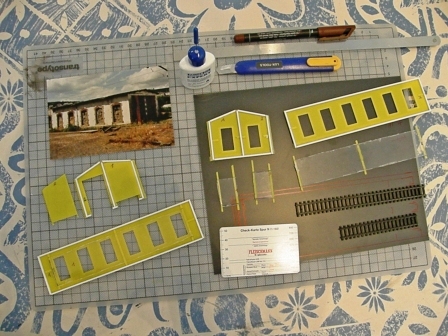 I put the wall sheet upon the "glass panel" and draw the windows with an overhead felt pen. On a real glass panel I cut narrow stipes of insulating tape and lay the window frames out of them upon the transparent plastic sheet. Between the wall sheet and the glass panel I glue narrow stripes of Busch 7203 plastic sheets. For the doors I carve planks into the yellow Busch sheets 7203. I paint them with matt brown Humbrol 62 color. After this, I paint the wall stones with a grey mixture and the walls with Humbrol 34 white. I paint the walls inside in grey. I glue the windows and the doors behind the walls of the building. The walls are reinforced with Evergreen 153 strips. For the roof I glue Kibri slate sheets 7971 upon yellow Busch 7203 sheets. The Kibri sheets have first been bent with a file at the roof top and near the gutters. The gutters consist of Evergreen 241 Half Round stripes. I glue them upon narrow stripes of Busch 7203 yellow sheets. I bend the waste pipes out of 1,5 mm wire. I fix them with super glue. Afterwards I paint them with Humbrol 56 silver colour. In the end I make small repairs everywhere with a 5:0 brush. 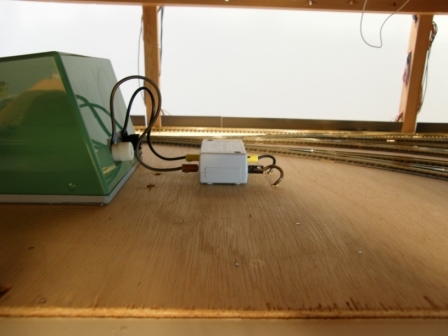 The building is fixed with screws to the layout board. The engine shed is no longer connected to the tracks of the station. It is now used as a shed by a construction materials dealer. The Heljan brewery N 678 was altered. To reduce the height, stripes were cut out of the walls. A roof and a platform to load the waggons and the lorries have been added. The brewery was painted beige with Humbrol colours. The gaps have been filled with Plaka colours. The chimney is from Kibri kit 7224. Established on the segment, everything looked too big. I cut out the middle level of the main building with the Roco saw. Afterwards I glued the wall parts one upon the other and reinforced them at the back with Evergreen stripes. I filled the gaps with Humbrol Model Filler. Finally I made small paint repairs. A frame with the height of 3,5 mm encloses the brewery. It has to receive the recessed track of the yard. A small administration house was built with the help of photographs out of Busch plastic sheets, Kibri slate sheets and Evergreen stripes. The windows and the doors consist of stripes of adhesive tape, which were laid on transparent sheets from former packaging. Next to the football ground a refreshment stand with a ticket desk and lavatories will be set up. I took photographs and with the help of Preiser figures I drew a plan on scale paper. After this the building was made as described above. As you can't see the interior of the house any more, I decided to equip it with a LED light. I made the roof in a removable way. With the compass saw I cut a 3 mm MDF board for the street and the standing places of the football ground. In front of the football ground I had to change the landscape on the segment with the station. With my Proxon grinding machine the bend of the road was a little adapted. A transparent film was laid upon and the route was drawn upon with a OHPen. The film was cut out and the dimensions drawn on a yellow Bush plastic sheet 7203. This was cut out and fixed with stripes of window putty upon the landscape. Behind the football ground the road climbs a little and the trail to the Fatima sanctuary branches off. This has to be estabished on the following segment above the tunnel. As usual I made the Fatima sanctuary with the help of photographs and a Preiser figure. The bows were filed out of a 4 mm wooden strip. As a pattern I used a cut-off button of a trouser. 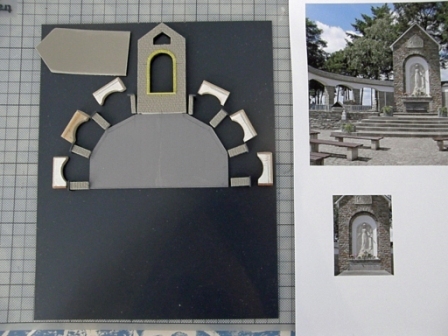 The Fatima itself was a cut out photograph glued upon a grey plastic sheet. The sheets are Kibri (37971 for the walls and 37960 for the roof) and Busch. The profiles are Evergreen and the colours Humbrol. As fences I used Vapeur70 and Heljan ladders. The sanctuary will be illuminated by 2 Viessmann 6530 searchlights . On a very old photograph I discovered a water tower. I had to adapt the dimensions to the shed and the brewery. For this I placed a paper roll and cut it until it was suitable. In order to draw the octagons, I opened an autoform in the PC Word programme. 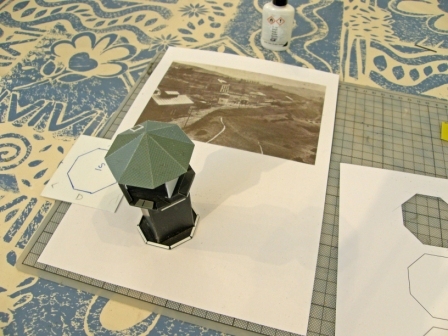 I formated it in the dimensions of the tower und printed it on cardboard. Once cut out, I could transfer it upon plastic sheets. I built the tower as often formerly described. It was equipped with a Ratio ladder and a Viessmann 6442 lamp. With the Word programm I drew a jauge, railroad pannels and posters. They were printed on a white film. At the railway siding of the brewery a gate will be installed. I use the removable Viessmann water crane 5832. It is sawn and flush mounted. To operate it, I had to connect a Viessmann Power Module 5215 on my Fleischmann transformator 6705. The gate is operated by key switches. In addition to this a Viessmann relay 5551 operates the Saint Andrew crosses 5803 for the brewery yard and cuts the current when the gate is closed. For this I had to install subsequently a current break with my Roco saw. It is supplied with current by a Fleischmann rail- joiner 22217 with soldered cable. I fixed one of the Saint Andrew crosses on to a self-made mast out of brass H profiles. The three brewery buildings received a LED interior illumination. Outside, above the doors, came Viessmann 6442 lamps. Underneath the roof of the loading platform I installed a white LED. Underneath the brewery I fixed the Faller smoke generator 180690 on a plywood board. A plastic tube was placed upon and guided trough a hole to the chimney.This was drilled and filed at the bottom. As usual I made the lorry garage out of Busch, Evergreen and Kibri sheets and stripes. The furniture comes from Modellbahn Union. The tires are Faller 975078 items. The chair and the oil stoves are self-made. Inside the building was installed a white LED. The lamp above the office door is the Modellbahn Union N-A00252 item. The railings for the stairs were plied out of 0,3 mm wire and fixed together by instant gel glue. The vent pipes of the garage were made out of a tube and sawn-off brass nails. The brewery gate was made out of Busch sheets, Evergreen stripes and 0,8 mm brass rods. I cut the Viessmann 5832 water crane and drilled a small hole into the base. The gate was glued with gel instant glue. The wall with the gate mechanism is hollow underneath an is simply to be put upon a stripe. The Kibri 37969 wall sheets got a cote of Humbrol 67. Afterwards single stones were painted with Humbrol 27, 64, 31 and 98. When everything was dry, I applied water-soluble Plaka 72 colour. With a moist towel I dotted and rubbed, so that the grey colour remained in the joints. I installed the Mafen 4131.12 dwarf signal in front of the brewery gate. The cable conduits were made of plastic sheets and painted. The signal was connected to the relay that operates the gate, the Saint Andrew crosses and the driving current. In the back of the brewey yard I installed a further uncoupler. I built a diesel tank and a filling station for a tank wagon out of Faller parts as well as sheets and bars of many providers. As a lamp I used the MU_N-A00257 and as a diesel fuel pump the MU_N-A00124. The brewery obtains the fuel oil to brew and the diesel for their lorries by rail. This means further shunting. At the football ground I built standing places, 2 gates, a scoreboard, hedges and fences. Next to the engine shed came a small office building. On ebay I bought a collection of used Viessmann railwaylamps. Out of 2 mm brass profiles I made H-profile streetlamps. A pedestal of plastic sheets allows it to stick the lamp into a square hole in the soil. On the wooden landscape structures I fixed Noch wire netting with the glue pistol. On this I laid plaster bandages. The rocks are collected slate stones. Afterwards I modelled the landscape with window putty. In front of the brewery I fixed a fence out of the shipmodelling range. Now the window putty has to dry for several weeks. On the station segment I motorized the Faller platform crane with the Viessmann 5832 item. With 0,3 mm wire I altered the angle of the Faller crane so that it doesn't touch the wagons. The goods shed recieved a LED lightning. Next to the shed I built a lorry scale with plastic sheets and profiles. The pub was wrapped into Auhagen pavement scheets. It received interior lightning, new doors, tables, chairs, fences and a letter box. A Viessmann 6474 lantern enlightens now the terrace.The wall pedestals of the three buildings received an emanel and water painting in various colours.